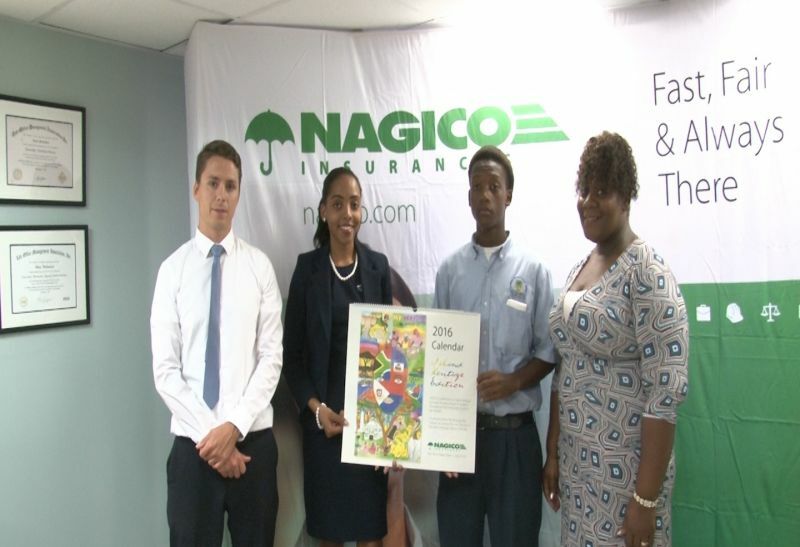 ROAD TOWN, Tortola, VI- Elmore Stoutt High School’s (ESHS) Kachife Bradshaw is among the 12 finalists from around the Caribbean whose work is featured prominently in NAGICO Insurances 2016 calendar which is currently in circulation in the 19 Territories in which the company operates. NAGICO BVI’s Customer Relations Officer, Ms Shaquilla Smith made the official announcement during a ceremony at the company’s office on Water Front Drive. Accompanied by his mom, Cutelin Butler, Kachife said he is proud to be one of the 12 winners in the competition. His drawing portrays elements of the Virgin Islands cultural imprints such as an island house, a brick oven and tropical fruit trees. Kachife’s drawing, inspired by the work of local artist Reuben Vanterpool, headlines the month of August. “I want to thank my mom and dad who helped me throughout the days when I used to just draw for fun,” Kachief told reporters. His mom was equally pleased with the accomplishments. “I am very proud of him. He started drawing at age of 11 and when he started drawing I was very amused at some of his drawings. When he told me he was going into the competition I was fully supportive and I just want to say he is the second of my boys and I am so proud of him and hope that with this achievement he will go further to make his art a success,” said Butler. Insurance Manager, Simon Cross said that it is remarkable that Kachief beat over 1000 persons across the Caribbean. “NAGICO is very proud to be supporting young hopefuls like Kachife, supporting what they do and what they dream. We do a number of sports sponsorship throughout the island; with Reuben Stoby and his running; Jeron Smith and his tennis; Joe Chapman and his squash. This is really what NAGICO is all about in supporting people and their dreams. Ms Smith urged customers of NAGICO to uplift their 2016 calendars either from the Road Town or Virgin Gorda office. NAGICO’s art competition was open to students ages 6-16. To enter the competition, each student was required to submit a drawing depicting the theme, 'My Heritage, My Culture'.